Biking and walking are becoming increasingly visible modes of transportation in a widening variety of cities. Big, progressive cities like New York and San Francisco often hog the headlines, but plenty of mid-sized cities that oriented (or re-oriented) themselves exclusively around automobiles for the past half century are making big strides in implementing more versatile transportation networks. From sharrows to bike lanes, curb cuts to pedestrian plazas, cities of all shapes and sizes are becoming much friendlier places for people to get around without a 4,000-pound hunk of metal strapped to their bodies. Pittsburgh, PA, is one city where you can really get a strong sense of how a mid-sized city is re-thinking its streets as places, and working deliberately to create a network of infrastructure that supports biking and walking. The key to any long-term campaign is to coordinate all of your small wins so that they add up to something larger. In Pittsburgh’s case, recent wins are starting to add up, and with the right guide, you can really start to see how the city’s hilly topography is being used as an asset to shape the city around walkable and bikable corridors in a citywide network. Fortunately, if you’d like to see this for yourself, there’s a great opportunity right around the corner! Next Thursday, September 19th, Pro Walk/Pro Bike: Pro Place 2013 will take place at Pittsburgh’s Carnegie Mellon University. 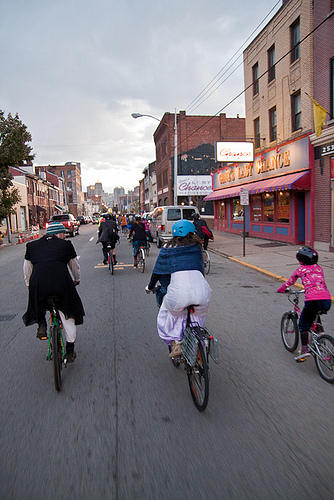 Walking and biking advocates from around the Pittsburgh region (and beyond!) will gather to network and plan for next year’s big PWPB gathering. If you’re in or near the area, make sure to sign up and head down to CMU for the day, as we’ll be taking a tour of the city’s recent bike facilities and some of its most walkable neighborhoods, led by Stephen Patchan, the City of Pittsburgh’s official bicycling coordinator. The tour will feature riding time on East Liberty Boulevard, which recently went through the Road Diet process; some very popular new green lanes created (through a grant from Bikes Belong) to increase visibility for bicyclists at a complicated five-point intersection where a bridge ramps down right into a major crossroads; as well as some facilities unique to hilly cities like Pittsburgh, including a section of Millvale Avenue with different markings for climbing and descending a steep grade. Patchan has also planned the route carefully so that participants will be on streets with dedicated bicycling infrastructure the entire time, both to display the effectiveness of network-oriented planning, as well as to show off the positive effects that this infrastructure has had on streetscapes. Bike-friendly districts tend to be pedestrian-friendly as well, and the tour will move through four distinct, vibrant districts, on both commercial and residential streets. You’ll get to experience the leafy, urban-village-style streets of Shadyside, the charming brick Victorians of Friendship, the bustle of Bloomfield’s Liberty Avenue corridor, and the remarkable old center of East Liberty, once the city’s “second downtown,” later a poster child for the perils of urban renewal and, in recent years, the site of one of the city’s key neighborhood comeback stories. Remember: there is still time to register for next week’s meeting and tour, and the event is totally free to attend. Click here to register for Pro Walk/Pro Bike: Pro Place 2013! Explore the tour route below, on our interactive map!